Drinking Olive Oil - Healthy or Not? The Oldest Woman in the World - Thanks to Olive Oil? Drinking olive oil means not the same as eating it. Take Mariam Amash for example (see this article on MSNBC). This Arab woman from Israel not only claims to be 120 years old, she also attributes it – and her good health – to the fact that she drinks a glass of olive oil each day. She also still goes for a walk each day and loves to receive guests and visitors in her house. Now as the Arabic cuisine in Palestine / Israel is already rich in olive oil, drinking an additional glass per day (I couldn't find any information on how big the glass is) means ingesting a lot of the good, green gold! But you must also consider that this woman worked a lot during her life, she has 10 children to start with. I am not sure that drinking a glass of olive oil a day wouldn't be calories overkill in my case ;-) But what are actually the health benefits of olive oil? What is all the fuzz about the Mediterranean diet? First lets clear what the Mediterranean diet is actually. So, Where do People Drink Olve Oil? The habit of drinking olive oil has been reported from so different countries like France, Israel / Palestine and the Greek island of Crete amongst others. Whilst olive oil is healthier than other, animal-based oils and fats, it is still a fat with a staggering 9 calories / gram. Before you now decide to drink an additional glass of it each day, you should better add also some exercise to the plan, if not you will gain weight very fast. If gaining weight is your goal, then drinking olive oil is surely a healthy way to achieve this. Other health benefits may include lower risk of coronary disease (as mentioned above) and even a lower risk of suffering from certain types of cancer, especially interesting are reports from Greece that state that women on the island of Crete (a major olive oil producer) are having a significantly lower risk of suffering from breast cancer during their lifetime. 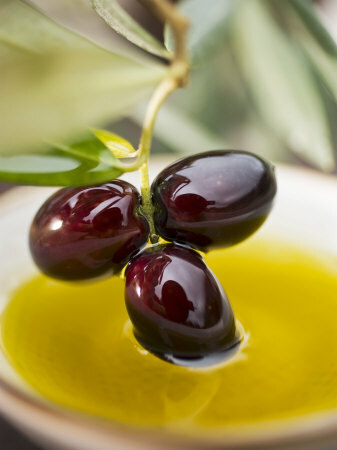 Olive oil is also reported to lower blood cholesterol without lowering the 'good' HDL cholesterol at the same time. Related to this findings are the claims that regular intake of olive oil can lower the blood pressure and helps to regulate blood sugar levels. Constipation A teaspoon or two in the morning, before you eat or drink anything else helps to get things going in a natural manner. Skin Olive oil is a great skin cleaner and excellent to lift make-up in a gentle manner from your face. It also helps to achieve a nice, even tan when used as an after sun treatment. Vitamin Absorption Many vitamins, like E, D and K, are called 'fat soluble' vitamins, which means also that our body can only absorb them if a fat or oil component is present. Adding a teaspoon of olive oil to your freshly pressed carrot juice makes hence an awful lot of sense. Gall Stones Some people claim that a mixture of olive oil and lemon juice helps to dissolve and to expel gall bladder stones. Might be, might not be. Better ask your GP or health care professional first. Oil Pulling Last but not least, olive oil is also used in a natural detox method, called oil pulling. Hereby you swirl a small amount of oil around your mouth and through your teeth first thing in the morning without swallowing it and until the oil is thin, white and foamy. Then you spit it out and clean your mouth first with water and then you brush your teeth and tongue normally. That is said to help to clean your teeth thoroughly and to detox your whole body. What is the Best Olive Oil? No article about olive oil would be complete without explaining a bit about the different quality levels of it. In short, the best olive oil would be organic and extra virgin. Extra virgin means it has be cold pressed, not suffered from heating nor have any chemicals been applied to increase the oil extraction. As for the taste, the only thing you can do is to try out a few varieties and see which one you like best. Perhaps they offer an olive oil tasting event where you life? That is a great way not only to find out which variety you like best but also to learn a lot about the green gold as it is also called. I hope you have enjoyed this article about the health benefits of olive oil drinking! Feel free to leave me a comment and / or to thumb it up and / or to share it with your friends. Does Olive Oil Make Hair Grow Faster? Does olive oil make your hair grow faster? Does it make your hair healthier? What are the best ways of using olive oil in your hair care? Find out here! How much water should I drink per day? How much is enough and is there something like drinking too much water? This article aims to answer all these questions - and more. I eat olive oil on salad an occasionally dunk bread in it, but I think I will use it more often - and then go for a walk! Yes Katiem2, olive oil has many benefits, both used internally and internally! I love olive oil, the taste is very pleasing to me. I cook with it use it on salads and the like, olive oil is such a great addition to many foods. Its amazing the health properties it holds. Slovenia? Lovely place! We passed there through on our journey from Prague to Dugi Otok ;-) And yes, I am always interested to learn more, why don't you write and publish an article about it here on Wizzley? Grandi, where are you from? Spain? I had home-pressed olive oil there, and home-flavored ones also, and it was oh sooo good!